Syscoin and Blockchain Foundry Co-Founders Dan Wasyluk and Jag Sidhu were on-site at last month’s Anarchapulco conference to work with Lode Project for the soft launch and Token Generation Event (TGE) of AGX. “We’ve been working here on the soft-launch of AGX & we helped with the Blockchain components for it […] Key takeaways are: ways to improve the experience, certain phones the app behaves differently on, things we can make faster and easier; and that is what soft launch is for.” Wasyluk said while speaking with LODE Ambassador and CTO/Co-Founder of Atomic47 Labs, Dave Olsson. Wasyluk continued “It’s cool seeing people from the silver community just as excited about this as people from the crypto community -I don’t know of any other products that bridge those two demographics.”. “This kind of thing is really beneficial to Syscoin too, AGX and LODE are tokens on the Syscoin platform — even while we have been here, Jag has made improvements to Syscoin 4, which is forthcoming[…]Seeing the level of use that we are seeing here of a real token has surfaced some of these other sorts of discoveries that we’ve been able to leverage improvements on within the core itself” Wasyluk said; Olsson concluded by stating that “We are one step closer to AGX in the wild”. LODE is building the world’s first Cryptographic Silver Monetary Systemutilizing the blockchain protocol to enable the creation and distribution of two tokenized assets, each representing a unique relationship with investment-grade silver. Q: Re your comment on java, do the requirements for exchanges vary that drastically from say Bittrex to say Binance ? A: In sys4 Jag also added a bunch of indexing stuff to the core so that exchanges could more readily work with assets. We consulted directly with exchanges for those requirements, but some exchanges still run stuff on top of syscoind to talk to it, those guys wanted syscoinj basically and so we kinda did both, because we ended up needing a lite version of syscoinj for sys4 anyway, since the agent (superblock) code runs in java. Q: Since a sysx asset will be redeemeble for sys4 and vice versa, is this something that you anticipate being possible directly on say a binance like platform or am I misunderstanding the bridge? and of course having an erc20 representation for SYS means you can integrate into a lot of services that support that framework, since erc20 is a standard across all these services now. For all the official and latest news releases please follow us for all the latest community news via our SCMT Twitter account, as well as hot-off-the-press Syscoin and BCF updates. 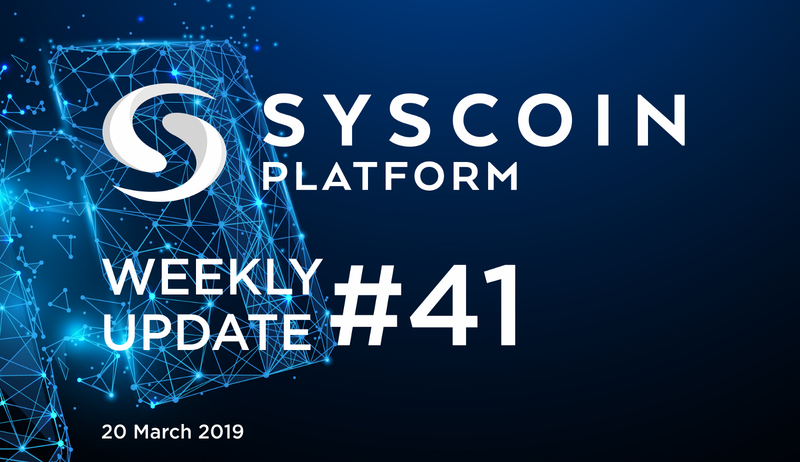 The Syscoin Team will also share our posts via the official Syscoin Twitter, Facebook, Instagram & LinkedIn social networking channels, to help spread the word.